First, what is an inheritance word? 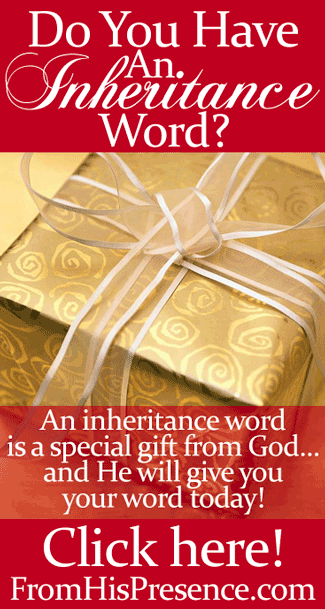 An inheritance word is a passage of Scripture that God speaks into your heart as His special gift to you forevermore. It’s not the same as a Scripture that describes your calling. I have several of those, but they are not my inheritance word. Your inheritance word describes something that God wants to be to you (in relationship), or something that He wants to do for you. It’s a promise He makes to you. It’s an expression of His love and watchcare over you for the rest of your life. Your inheritance word will comfort you. It will grip your heart so much that you will be able to stand on it, even when you don’t have the courage to stand on anything else. From this time forth, and even forevermore (Psalm 121:1-8). I have meditated on this passage over and over since then. It means so much to me. Whenever I hear the Brooklyn Tabernacle Choir song, “My Help,” that goes along with it, I cry like a baby. God had my number when He spoke this passage to me. It’s His covenant with me to take care of me, no matter what. Even if I’m hurting, I know from my inheritance word that the Lord will keep me. So would you like an inheritance word of your own? Ask God to give you an inheritance word. As you seek God about your inheritance word, He will show you a passage that will make you cry, laugh, whisper, or all three. When He does, ask Him if this is your inheritance word, and you will hear his response. You will love that passage the rest of your life. It will calm you, comfort you, lift you up, encourage you, and grip your heart. You can claim it whenever you are feeling down. You can pray it when you are going through hard times. Your inheritance word will become your story. Are you ready for God to give you your inheritance word? If so, won’t you get alone with Him and ask Him for it today? And when He gives you your word, would you let me know your report in the comments below? I’d love to hear about it! Thank you for the lovely idea. Yes, if I ask AND listen, God shares some wonderful insights. Amen! Thanks for reading, Angela! Love this so encouraged! Buckets of Love back to you ! Jamie I read out that passage in my mind before I scrolled down and saw that you had it. What a wonderful father we have. Thanks for sharing, Jamie. I felt God told me that Isaiah 61 is my inheritance word. Praise God! That’s a very special passage to me too. The call of God on my life. I pray that Abba Father would fulfill every word of it in your your life in abundance, and that you would find much joy and delight in watching Him do it. I don’t have my Bible with me now here however, this really touches me because I have this quote/words from the Scripture, when I hear it, it just brings hope and strength in me. So, I don’t want to say it is my inheritance word until The Master reveals and talk it in me. Yes, thank you so much for making this a reality because all of us have this word that just sum all up. You are a blessing to many. Your inheritance word I read last night and it’s so powerful and comforting. I follow Graham Cooke also. Thank you for all your encouraging emails, blogs and prayers. Judges 7 is my inheritance word. Ezekiel 4:15-17 is my inheritance word.Thank you Father God. You bless me every now and the Jamie when I read yr blog. Really sometimes i just cry because really i wont forget the day i come across your blog you are God sent to me. I ask God to give me my inheritance word. Thanks for sharing this post Jamie…I received my inheritance passage (Jer 29:11) a few years ago during a very tough time in my life. It reminds me to be patient, even when my heart is broken & lonely and despair sits closer than hope. Isaiah 61. I knew it before I even finished reading yours. thanks Jamie for making me know about INHERITANCE WORD, this morning God absolutely confirmed that Psalm 27 is my Inheritance Word….I ALWAYS read that chapter every morning and this morning God spoke out loud in my spirit when l was reading the chapter….it really gives me solace and great joy…. may God richly bless you my sister in Christ. Thanks Jamie. I am trusting the Lord to give me my inheritance word. God bless you. God revealed to me that Nahum 2 contains both my inheritance and my calling! So excited!! Thank you for your courage to follow the LORD in this ministry. I am confused. God led me to Psalm109 20-31. The wounded heart. Is God telling me that He will cause shame to manifest in the hearts of those that wrong me in order to set things right and bring more order to my life? I always feel blessed but I admit I have had a rough time dealing with some people although you would never know it as I try to guard against showing my struggle. I was bullied for many years as a child and even at work , have experienced it. That said, God has greatly blessed me with a very loving, trustworthy husband and a best friend I can totally count on and successful children, but still the wounded heart passage made me cry. I go to counselling and have told my Christian counselor that I really need to gauge my reactions to people around me because many have been difficult and I try really hard to not over react and to be kind in the face of adversity for the Lord’s sake and also I have compassion. My own bad experiences make me careful not to do harm. Thank you for I have my inheritance word that my Lord gave me . Proverbs 3:5 thanks again God bless you love u in Christ. I think it might be OK to have another word in addition , but isn’t it interesting that God takes the credit for things we immediately blame the devil for . While I was still reading your word I asked the Lord for my inheritance word. He started speaking to me immediately and gave me scriptures from three or four sections in the Bible. Thanks! Psalms 27:13 I had fainted,unless I had believed to see the goodness of the Lord in the land of the living. I immediately heard Psalm 23 as soon as I asked him to give me a inheritance word I heard “The Lord is my Shepherd I shall not want”. That scripture has been ringing in my spirit for months now. Thank you Father for always being so faithful and you Jamie for always listening and feeding us that manna from heaven!!! got mine during one of the consecration nights at Dwelling Place Church International.. it’s Psalm 139 in the Passion Translation… I cant even read the entire chapter before I am weeping and by the end I am totally messed up in His presence! Awesome, Terri! Thanks for reading! Psalm 32:7-8; Zech. 2:5; Isaiah 41:10-13; Zeph. 3:17; John 1:12-13 & John 14:26 & newest one Genesis 9:12-17. Then the song you gave us from Presence Seekers Beyond the veil~ Come Unto Me. Thank you and God Bless your ministry 1000 times more!! 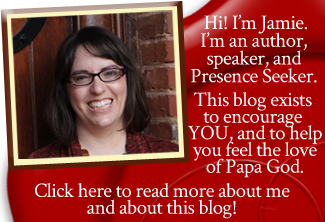 Jamie, I didn’t know I had an inheritance Word until just now as I came across your message on it. Perfect timing! We have been fighting for my son for 2.5 years regarding serious health issues plus other issues regarding his spiritual health. I was writing to my sister all that had happened to him those past 2.5 years but at the end I began to write down all God had done for him these 2.5 years. One of the verses I have consistently stood on and proclaimed for him is Isaiah 54:17: No weapon that is formed against thee shall prosper ;….. only I add his name in. I wrote this down at the end and it hit my spirit! It went within me! I looked at what I written and saw that all the things he had gone through including 2 death sentences by the doctors had never came to maturity – nothing had prospered!!! I began to cry and laugh and I know God has given me a new strength and a new stronger faith. I now know that is my inheritance Word and am I ever thankful!!! Have been so blessed by “My Help” sung by the Brooklyn Tabernacle Choir. Jesus is so faithful and answers our prayers for His help.